SYNDICATED COLUMN: Why Isn’t Organ Donation Mandatory? This week America’s news media obsessed over the shooting deaths of 12 people in Washington. The usual arguments over gun control seem irrelevant since there isn’t much that could have been done to prevent those particular killings. It was a navy base. Even in England, members of the military have access to automatic weapons. And even if we were inclined to start locking people up for hearing voices or feeling strange vibrations, we can’t build enough mental asylums to hold all of them. On the other hand, it is estimated that 18 people die every day due to a national shortage of organ donations. This crisis can be solved. Don’t worry: this is not one of Those pieces calling for you to consider signing the donor section on the back of your driver’s license. My solution is more radical. When you die, the government should take your organs. The transplant shortage is acute. Some patients are so desperate that they travel on ethically-dubious “medical tourism” junkets to China, which implants organs from executed prisoners. Others accept D-rate organs. Patients at the University of Maryland recently accepted kidneys that had recently been operated upon for benign or malignant tumors. Better bad kidneys than none at all. The waiting list system is widely viewed as arbitrary and unfair. In June 2013 a federal judge made news by issuing an order suspending rules that effectively blocked children under the age of 12 from receiving organs from adult donors. Several children who might have died without the procedure benefited. Unfortunately, the court’s ruling probably killed a similar number of adult patients. Like cash, life is a zero-sum game. It is widely believed that celebrities and wealthy people, most notably Billy Martin in 1995 and Steve Jobs in 2009, are able to cut the line, moving themselves up the waiting list. Technically, this isn’t true. But practically, it is. Where resources are scarce, politics get ugly. In 2012 the University of California at San Francisco kidney exchange was accused of denying a kidney to a man because of his status as an undocumented immigrant. A petition campaign changed UC officials’ minds. This being America and anything more progressive than the collected works of Ronald Reagan being off the table, the mainstream media turns to free-market solutions: paying prospective donors, either while they are alive or after they die, for their kidneys, livers and other body parts that could be used to enhance or save someone’s life. In 2010 The Wall Street Journal published an essay urging that we adopt Iran’s approach, which guarantees a year of health care and a cash payment to donors. 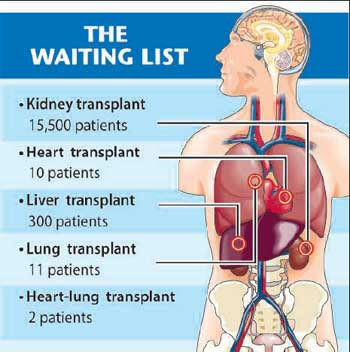 A June 2013 Slate piece by Sally Satel, “How to Fix the Organ Transplant Shortage,” called for “providing in-kind rewards — such as a down payment on a house, a contribution to a retirement fund, or lifetime health insurance” to donors. These merchantilist suggestions have gotten traction. A 2012 poll found that 55% of Americans now believe that selling your organs ought to be legal. And maybe they’re right. But it’s easy to imagine how the commodification of body parts could corrupt an already flawed system. Do we want to live in a nation where the unemployed resort to auctioning off pieces of themselves to stave off foreclosure? There’s not much we can do to reduce demand for organs. So let’s focus on the supply side of the equation. Efforts to guilt Americans into donating voluntarily are failing those 18 Americans a day. But not every healthy person who refuses to sign a donor card is heartless. I know because I’m one of them. I refuse to endorse a system that rewards the rich at the expense of the poor. If the system were more transparent, and treated everyone equally, there’d be more donors. However, the system being what it is, that’s not going to happen. Which brings us to the government’s role. I don’t understand why organ donation isn’t mandatory. Why isn’t every corpse harvested for all of its usable organs? It isn’t a property-rights issue. You don’t own your corpse. Neither does your family. If it did, they could leave your body to rot in the backyard. Laws dictate how to properly dispose of a dead person. There have been baby steps toward mandatory donation. In 2010 a New York assemblyman introduced a “presumed consent” bill that would have automatically enrolled all New Yorkers as organ donors unless they opted out (analogous to the federal “do not call” list for people who don’t want to get telephone solicitations). Two dozen other nations have similar laws. The bill failed. If the government can save 18 people a day by harvesting every available organ, why doesn’t it pass a law making it so? As a student of history, I am sympathetic to slippery slope arguments. And as I wrote above, I despise the way that the current health care system prioritizes wealthy Americans over the less fortunate. But when you boil it down, Lindsey’s argument is purely emotional. It’s my liver, and you can pry it out of my cold, dead carcass…or not. Anyway, our top government officials don’t care about those concerns. In the end, it comes down to the power of superstition. When we die, we cease to exist in every way. Our bodies decompose. Only idiots believe in God, the Devil, Heaven, Hell, an afterlife. Whether your body is harvested for organs, eaten by cannibals, or minced to fertilize topsoil, you will never know the difference. Anyway, no major American religion teaches that what happens to your corpse affects your destiny in the hereafter. Between our smart phones and amazing technology that allows our government to spy on our every digital moment, citizens of the United States of America feel that they live in an incredibly modern society. But not in our hearts, not in our souls, and certainly not in our brains. About 2.5 million Americans die every year. Most are burned or planted in the ground, completely wasted. Vast numbers of them rot away, their bodies containing potentially life-saving organs, left intact — or embalmed — for only one reason: politicians are too cowardly to challenge the ancient idea that there is something sacred in a hunk of flesh. This entry was posted in Blog, Columns and tagged Arthur Caplan, Billy Martin, CNN, Death, Drivers License, Gun Control, kidney transplants, liver transplants, mysticism, Organ Donation, Religion, Sally Satel, Slate, steve jobs, Stewart Lindsey, University of Pennsylvania, Washington Navy Yard shootings on September 20, 2013 by Ted Rall.